Firstly before everyone goes away and settles down for the Xmas holidays, a bit thank you to everyone who has supported me over the past year. It’s not been an easy year, but it’s been lovely to have ‘met’ (albeit virtually) so many great people in the glass and crafting worlds. 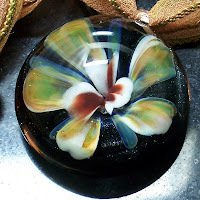 Thank you to all who’ve taken trouble to comment on my blog, given inspiration and advice, and of course special thanks to all of you who have been kind enough to buy some of my glass creations! It is very appreciated, not just because it means I can buy more glass, but it means I must be doing something right for you to want my glassy bits! Thank you, and have a merry Xmas, and a great New Year! I’d love your shopping feedback!